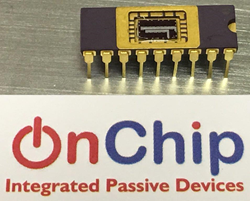 A global leader in Integrated Passives, OnChip Devices today announced the ability to develop and build semi-custom and full-custom Silicon based Resistor and Resistor-Capacitor Arrays using its proprietary Thin Film Process Technology. The circuit schematic can be Application specific and can include a wide range of resistor and capacitor values, tight resistor tolerances, and complex interconnections. These arrays can be manufactured from design concept to working samples in less than 8 weeks. Customers can replace discrete Resistors and Capacitors into a single monolithic silicon circuit to match their product needs. These R and R-C arrays can provide significant cost as well as PCB board-space savings. OnChip’s proprietary Thin Film Process offers Resistors featuring superior electrical stability and higher precision while maintaining a miniature size. These products are offered as bare-die or in standard Semiconductor IC Packages such as SC70, SOT, TDFN, uDFN, SOIC, QSOP, MSOP, TSSOP and DIP. All devices are 100% electrically tested and products shipped as bare-die are visually inspected to MIL-STD-883. All of these devices are operational in the full military temperature range of –55°C to +125°C. The custom thin film resistance network capability is available immediately at a Non-recurring engineering (NRE) charges ranging from $4,500 to $7,500 depending on the design complexity of the device. Products are shipped either in wafer-form, bare-die or as packaged products and can be built in 6 to 8 weeks. These components are designed and developed at OnChip Devices’ Santa Clara facility and are produced to the highest quality standards.